Did Jesus Christ really rise from the dead, or was his “resurrection” an elaborate hoax? Suppose you had been present at the events surrounding Jesus’ death, burial and alleged resurrection, and could study the evidence yourself. Suppose, as a skeptic, you had the power and resources to search for the body, interview witnesses, analyze data, seek the truth. What would you find? That’s the theme of Risen, a Sony/TriStar film opening February 19. Joseph Fiennes (Shakespeare in Love) plays Clavius, a Roman tribune and close associate of governor Pontius Pilate tasked with finding Jesus’ missing corpse. Tom Felton (Harry Potter) plays his aide, Lucius. This novel approach to centuries-old questions about Jesus’ resurrection uses dramatic historical fiction to let viewers consider the evidence intellectually and process it psychologically. “I really do see [the film] as a noir detective story,” explains Fiennes, whose prep included learning interrogation techniques from a police detective. (Spoilers ahead.) Clavius regularly leads Roman soldiers in battle, in ultimate pursuit – he admits – of his own personal power, prestige and inner peace. His boss, Pilate, who ordered Jesus crucified, wants to ensure the Nazarene is dead and buried. Clavius has an executioner thrust a spear into Jesus’ side to confirm death. He releases the body for burial in a tomb. Jewish leaders ask Pilate for a Roman seal on the tomb, lest anyone steal the body and perpetrate a resurrection hoax. Clavius and his troops ensure the body is in the tomb. It takes seven men to roll the huge stone against the entrance. They apply the official wax seal. Guards stand watch. Sunday, on learning the tomb is empty, Pilate orders Clavius to find the body. Clavius inspects the tomb and sees Jesus’ grave clothes. He interviews guards who say they fell asleep and that Jesus’ disciples stole the body. Skeptical, he eventually coaxes the truth from one guard: religious leaders bribed them to spread the stolen body story. He interviews Jesus’ followers. Bartholomew’s shame in having fled after Jesus’ arrest contrasts with his joyful claim of having seen Jesus alive. He explains this means eternal life for all who believe. Personal connection: mine and yours? I can identify with Clavius’ journey from analytical skeptic to committed – but still analytical – believer. As a university student, I heard Bob Prall – who later became my mentor – discuss resurrection evidences at a campus meeting. Central to his argument were the critical elements of this film: the empty tomb and the appearances of the risen Christ. His presentation helped me understand that there really was solid evidence for Christian faith, that it was not fairy tale or legend, but true. Further research confirmed this for me. The stolen body theory didn’t make sense. The guard was too powerful, the stone too heavy, and the disciples too frightened. Nor could I explain away so many appearances. That year, I placed my faith in Jesus, radically altering my life direction for the better. Life’s not perfect, of course, but having a best friend who’s conquered death makes a big difference. 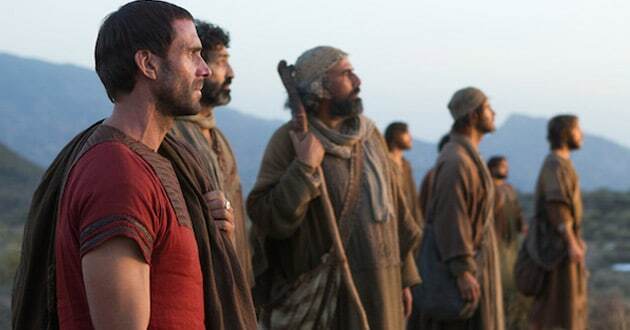 Risen is a fictional story artfully told that can prompt skeptic and believer alike to take a fresh look at what many consider history’s most important event. Might you?